In a large mixing bowl combine 2 cups + 2 tbsp warm milk, 6 eggs, 1 tbsp yeast, 2 cups sugar, warm melted butter, ½ tsp salt, ½ cup sour cream and 1 tsp vanilla and mix. This is best done with a stand mixer. Add 4 cups flour to make a batter with the consistency of sour cream. Cover with cling wrap and a towel and let it rise in a warm place for 2 hours. Once risen, add 5 more cups of flour; one cup at a time or until the dough no longer sticks to your hands to make a very soft and elastic dough. Stir in 1 to 1½ cups of chocolate chips or raisins, candied citrus peel or nuts. (Anything you like in your sweet bread). Cover and let dough rise another 2 hours in a warm place. Divide dough evenly into three deep 8″ baking pans, ensure your baking pans have been well oiled. TIP: Try not to handle the dough too much. Let dough rise uncovered in a warm place for additional 2 hours or until you see a significant rise. Bake at 180C for 35-40 minutes or until golden. Once the loaves are at room temperature, melt while chocolate over low heat and spread the melted chocolate over the tops of the bread. Enjoy! 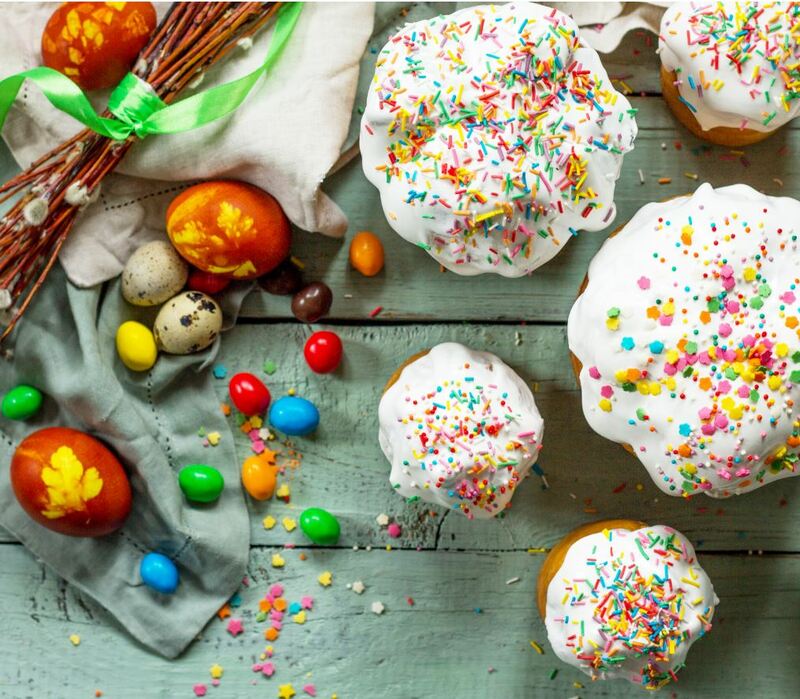 We hope you love these delicious European Easter Breads as much as we do!